Hardly a surprise and not a first. 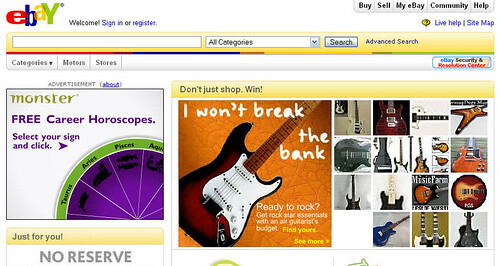 But it’s pretty saddening to see a great big ad on the eBay.co.uk homepage and above the fold at that. eBay reported last week that ad revenues were one of the few areas of the ‘marketplace’ business that are still growing strongly. So I guess it’s the shape of thing to come: sending visitors to other sites rather than sellers’ items from the homepage itself. But the ad for Monster does raise a question for me. eBay is all about targetting successfully and user segments. So who is this ad aimmed at? Disaffected sellers who are leaving the site, or the 77 members of eBay UK’s staff who have been put on notice of redundancy?